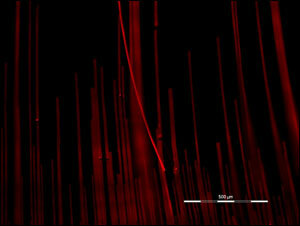 SYDNEY and PARIS, Jan. 23, 2013 — Water droplets in which silica nanoparticles are suspended can be carefully controlled with an ultraviolet laser technique that coaxes them to self-assemble into highly uniform nanowires, heralding a new generation of integrated optical devices. Silica microwires are the tiny and as-yet underutilized cousins of optical fibers. If precisely manufactured, these hairlike slivers of silica could enable applications and technology not currently possible with comparatively bulky optical fiber. The novel manufacturing technique developed by an international team of researchers from the universities of Sydney and Paris-Sud could, for the first time, enable silica to be combined with any material through a process of microwire self-assembly. Self-assembled silica wires illuminated by HeNe laser light from one end. Courtesy of John Canning. Silica, however, is not normally compatible with other materials, so functionalizing it to do more than just carry light has been a challenge. In addition, bridging the gap between the light-speed transmission of data through silica and electronic and photonic components — such as optical switches, optical circuits, photon sources and even sensors — requires some form of interconnect. But this transition is highly inefficient using optical fibers, and interconnection losses remain one of the largest unresolved issues in optical communications. If manufactured or self-assembled in place, silica microwires have the potential to operate as optical interconnects. They also could achieve new functionality by adding different chemicals that can only be introduced by self-assembly. And, unlike optical fibers, silica wires have no cladding, meaning greater confinement of light in a smaller structure better suited for interconnection. This ultimately minimizes losses and physical space. These scanning electron microscope images reveal how ultraviolet laser light changes the surface texture and wettability of glass. Figures (a) and (b) reveal subtle texturing after lower-energy exposure to laser light. 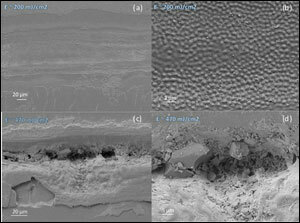 These textures made the surfaces more hydrophilic in (a) and more hydrophobic (water repellent) in (b). Higher energies produced a rougher and even more hydrophilic (wettable) (c) and (d) close-up of (c), surface. Courtesy of Optical Materials Express. To solve the silica incompatibility problem, the research team came up with the idea of using evaporative self-assembly of silica nanoparticles at room temperature, Canning said. The team members demonstrated single-photon-emitting nanodiamonds embedded in silica, which is the first step toward a practical photon source for future quantum computing. They reported their findings in Nature Communications (doi: 10.1038/ncomms2182). Carrying their work a step further, the investigators perfected the manufacturing process so that highly uniform wires self-assemble from nanoparticles suspended in a solution. Results appeared in Optical Materials Express. Naturally forming round droplets evaporate, producing uneven silica microwires based on microfluidic currents inside the droplet, which corral the nanoparticles into specific patterns aided and held together by intermolecular attractive forces. The nanoparticles then crystallize when the solvent, water in this case, evaporates. By changing the shape of the droplet and elongating it ever so slightly, the investigators could concurrently change the flow patterns inside the drop, controlling how the nanoparticles assemble. Figure (a) shows a roughly circular water droplet containing silica nanoparticles resting on an untreated glass surface. Figure (c) demonstrates how a UV laser can alter the surface texture, allowing the droplet to preferentially flow over the more wettable section, changing the shape of the droplet. Courtesy of Optical Materials Express. Canning and his colleagues achieved this by changing the “wettability” properties of the glass the drops were resting on using an ultraviolet laser. They altered and patterned a glass made of the mineral borosilicate, which made the surface more wettable in a very controlled way, allowing the droplet to assume a slightly more oblong shape. This subtle change was enough to alter the microscopic flows and eddies so as the water evaporated, the silica formed straighter, more uniform microwires. The processing technology could allow complete control of nanoparticle self-assembly for various technologies, including microwire devices and sensors, photon sources, and possibly silica-based integrated circuits, they said. It will also enable the production of selective devices such as chemical and biological sensors, photovoltaic structures and novel switches in both optical fiber form and on waveguides — all of which could lead to technologies that seamlessly integrate microfluidic, electronic, quantum and photonic functionality.